Online bids are now being accepted on the “LightWall Pavilion,” the Grand Prize winner of the inaugural ReSpace Design Competition made entirely of salvaged materials. The Competition was sponsored by Habitat for Humanity of Wake County, the American Institute of Architects’ Triangle section, and Architecture For Humanity’s Raleigh chapter. All proceeds will benefit Habitat Wake. On Saturday, June 1, from 9-11 a.m., AuctionFirst, the real estate bidding agency for the “LightWall,” will host a Preview Tour in the parking lot of Habitat Wake County’s ReStore’s parking lot at 2420 N. Raleigh Boulevard, Raleigh, NC 27604, where the pavilion is stored. Scott Hefner and Abe Drechsler, two NCSU students studying Environmental Design in Architecture, designed the pavilion, which measures 18.5 feet long, 11.5 feet wide, and 11 feet tall, and is destined for a variety of uses – from a gazebo-like structure in the landscape, to an artist’s or writer’s studio, a playhouse, a meditation retreat, etc. Old pallet racking from the Raleigh ReStore and reused glass bottles from various bars and restaurants in downtown Raleigh. The bottles create the “light wall” that filters sunlight and bathes the interior in colored light. Joel Lubell, a builder and volunteer at Habitat, conceived of and organized the ReSpace Competition “to raise awareness of reuse materials while showcasing creative and successful small space designs inspired by their use,” according to his website www.respace.org. Lubell and a small army of Habitat volunteers built the structure during a 48-hour construction blitz. The contest’s jury included North Carolina architect Ellen Weinstein, AIA, who admired the LightWall’s minimalism. “I just found it to be a simple and elegant structure in the landscape,” she said. According to the young designers, “simple” was a necessity. Both students were extremely busy as the deadline for submissions neared, so they designed something quickly during a two-hour brainstorming session, using markers and trace paper. “We reasoned that we didn’t have enough time before the deadline to add too many layers of complexity,” Hefner said. “Little did we know that the LightWall’s inherent simplicity would be one of its strongest traits.” The entire structure fits on a lowboy trailer for shipping anywhere in the country. 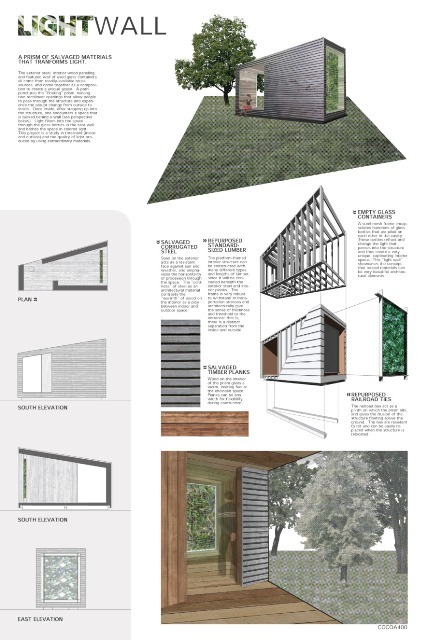 For more information on this and future ReSpace Design Competitions, go to www.respace.org. Congratulations to our friends at Raleigh’s Trailblazer Studios: their show “Salvage Dawgs,” the new reality series that premiered in November on the DIY network, has been bumped up to primetime on the higher rated sister network HGTV. The show airs Thurs., Jan 10 at 8pm and 8:30pm. 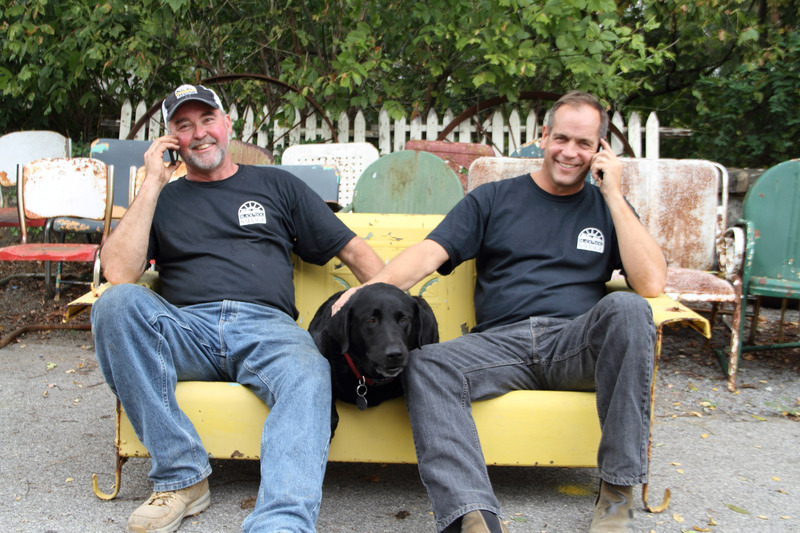 “Salvage Dawgs” chronicles the adventures and creativity of the Black Dog Salvage team – a Virginia-based architectural salvage business. Long time do-it-yourself fans and newcomers alike can enjoy salvage owners Robert Kulp and Mike Whiteside as they display their polar opposite personalities, making for a show filled with humor and suspense. While both share a passion for historical preservation, Robert is the self-proclaimed “bottom line guy” who focuses on the re-sale value. Mike is the “go big, go fast, go hard” guy who finds amusement in the unusual and engineers often hair-brained solutions for getting materials out of structures unharmed. From carefully extracting architectural elements from private homes and classic historical properties to disassembling old hospitals and crumbling mills, every show is a fast-paced treasure hunt. In Thursday night’s 8pm episode, the crew salvages the Washington Mill, an old cotton mill from the late 1800s. At 8:30, they explore the six-story, luxury Robert E. Lee Hotel built in 1926 to uncover a peg leg sink, French doors and pelican urinals. They also build a coffee table out of a salvaged panel and wood from the Izard House. Black Dog Salvage is located in the Blue Ridge Mountains of Virginia. With a mission to reclaim, renew and redefine architectural salvage for a sustainable future, it specializes in architectural elements from turn-of-the-century to mid-century modern homes, estates and buildings. The Wright-praised Paschal house needs a buyer to see another 62 years. 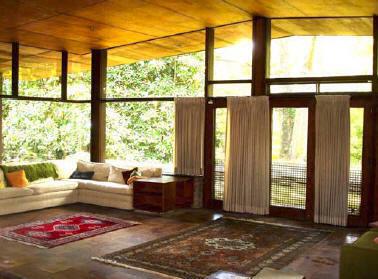 One of the most highly praised mid-century Modern houses in North Carolina, the 1950 Paschal house, is threatened with eventual teardown if a buyer doesn’t come forward very soon. 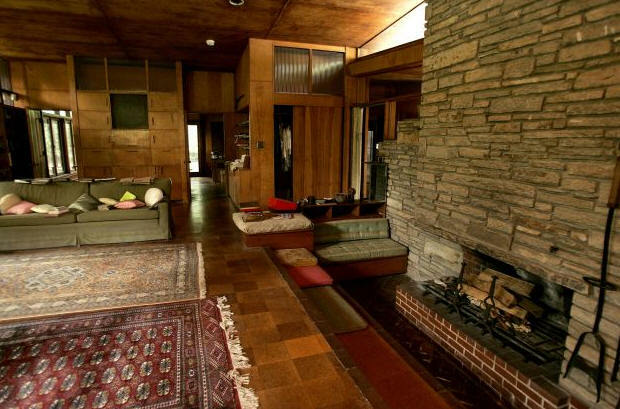 “We’re putting out a national preservation alert to save this James Fitzgibbon-designed icon,” said George Smart, founder and director of Triangle Modernist Houses, (TMH) an award-winning, non-profit organization dedicated to documenting, preserving, and promoting Modernist residential design. Listed on the National Register of Historic Places, the house has been empty and on the market for five years. The owners, the three Paschal heirs who are now in their sixties, are asking $3.3 million for the 3300-square-foot house on three acres in Raleigh’s Country Club Hills. “In these difficult economic times, that’s an unrealistic price,” Smart said. Experts, such as Frank Harmon, believe the house is no where near “too far gone,” as some have suggested. According to Preservation North Carolina’s Executive Director, Myrick Howard, the 62-year-old house is eligible for historic preservation tax credits if it is restored. 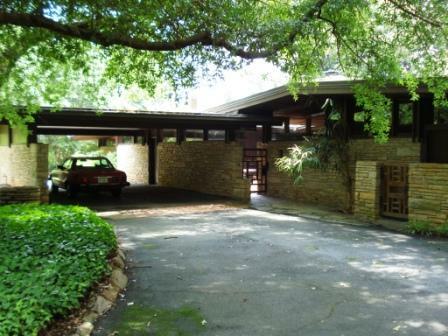 A real danger exists, however, that the house will deteriorate past the point of no return and require demolition, following the fate of the 1954 Eduardo Catalano House, similarly vacant and eventually demolished despite praise by Frank Lloyd Wright and being named the “House of the Decade” by House and Home Magazine. Comprised of granite, wood, and glass, the one-story Paschal house features a sweeping flat roof, extensive floor-to-ceiling windows, a floor-to-ceiling fireplace and sunken hearth, built-in bookcases and storage, intimate atria at each end, and Wrightian-inspired gates. The house embraced sustainability 40 years ahead of the times. Despite its lack of air conditioning, it was reportedly cool in the summer. The windows provide an abundance of natural light and ventilation, deep roof overhangs shade the windows from the hot summer, and cork flooring is a sustainable building material. The architect, James Fitzgibbon (1915-1985), moved to Raleigh with other members of the first faculty of the NC State University School of Design, hand-picked by the founding dean, Henry Kamphoefner. Fitzgibbon enjoyed a long partnership with R. Buckminster Fuller and his work was once featured in the Museum of Modern Art in New York, placed between that of Frank Lloyd Wright and Louis Kahn. For more information on the Paschal House, go to www.trianglemodernisthouses.com/fitzgibbon.htm and see Preservation NC’s listing at www.presnc.org (click on “Buy Property” then “Historic Properties for sale”). Following the popularity of its Appetite4Architecture dinners that connect the public with local Modernist architects, Triangle Modernist Houses (TMH) will launch the first Thirst4Architecture (T4A) happy hour in partnership with GoodnightRaleigh.com. The happy hour will take place on April 27 at Natty Greene’s Pub & Brewing Company in Raleigh from 6-8 p.m. The informal, cash-bar event is free and open to the public. No pre-registration is required. TMH is dedicated to preserving and promoting modernist residential design. Co-host Goodnight, Raleigh! is a popular online magazine run by 11 photographers, updated with images of the city at night and stories on the subjects of the photographs. Publisher John Morris is best known recently by his campaign to save the Milton Small-designed bookstore at N.C. State University. “Our film series and dinner events in the winter have connected hundreds of people within the architecture-loving public,” said TMH founder and director George Smart. “Our T4A events will bring together the larger design community around some of the area’s great restaurants and brewpubs. “We welcome architects, artists, designers, interior designers, realtors, engineers, contractors, property investors, building managers, Modernist homeowners, materials and furnishings dealers, and anyone with a huge crush on great architecture,” Smart said. 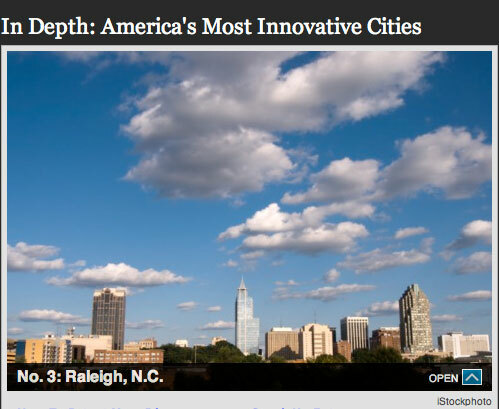 Smart hopes the bi-monthly happy hours, held around the Triangle, will continue building relationships, generating passion about good design, creating strategic alliances, and connecting people around Modernist architecture. I recently discovered this beautiful time lapse video compiled by Raleigh photographer Forrest MacCormack. An entire video compiled of stills shot at 1 second intervals– Forrest captures some gorgeous scenes that offer a fresh take around Raleigh’s Crabtree Creek, Lassiter Mills falls, and the Neuse River. Check it out. UPDATE: Here are Forrest’s notes on shooting and editing the video— check out Forrest’s blog here. How do you brand an office space? Raleigh’s Killer Creative Group was recently tasked with designing a Brand Identity for Access Office Business Center, a Raleigh, NC Executive Office Suite located near Brier Creek. Access Office offers fully furnished offices, conference room, telephone answering service, lounge, concierge and more– but what is appealing about the space (besides it’s close proximity to I-540 and the RDU airport), is its style. Local architectural firm Vernacular Studio designed the building’s upfit and the space is contemporary, yet comfortable. Modern furnishings and finishes are a departure from the typical ho-hum ubiquitous office space. Also of consideration was the air of cooperation and collaboration that the Identity needed to convey. A lawyer might be sharing space next to an accountant. Or a consultant. Or one of dozens of different executives that working in a shared space would bring them all in cross-contact with. The resulting Identity was designed to reflect this contemporary space, and overlapping of different services and professionals, thus the four chevron symbols that overlap and are separate, yet one. They influence and support each other. Also launched in tandem with the new brand ID is a small website. 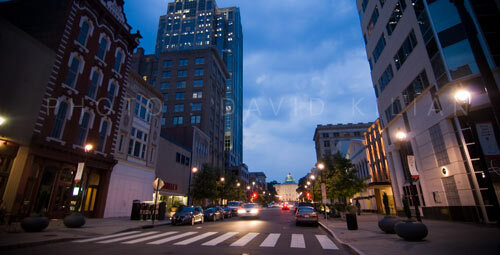 Check it out: http://accessofficeraleigh.com.